The SonoKleen ™ range of PartsWashers are the ultimate washers for difficult parts washing. They are front loading or pass-through parts washers / disinfectors, supplied worldwide to the Biotech, Pharmaceutical, Medical, Healthcare, Personal Care and other critical processing industries. Built to hygienic and sanitary standards and complying with ASME BPE, GAMP, ISPE and 21CFR11, the SonoKleen™ PartsWashers employ a combination of ultrasonic, immersion, turbulation, recirculation and spray cleaning to provide the ultimate clean. 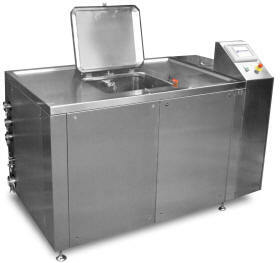 Parts washers provide an environmentally friendly, low water and energy usage washing facility for parts washing. Used for many different cleaning applications including change parts, compression tooling and many other components. The SonoKleen™ PartsWashers include liquid heating, chemical dosing, air drying, valving, pumps, instrumentation and an in-built control system. Reporting: Printed records optional chart recorder.